Spring may be on the way according to our calendars - but the weather doesn't quite agree with the North East set for a freezing start next week. Met Office forecasters have predicted that snow will fall in the region on Tuesday, with a Yellow weather warning issued for various parts of the UK. 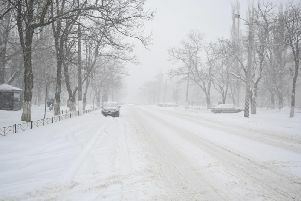 The Chief Forecaster's assessment said: "There is a lot of uncertainty in the extent and timing of snow during Tuesday. "Showers will bring a large variation in amounts of snow across even small areas with some places seeing very little. "The most likely time for a period of more widespread snow currently looks to be during Tuesday morning. "There is the potential for locally 5-10 cm of snow across eastern parts however where showers become more organised there may be more widespread snow cover." Snow will arrive in the North East next week. Forecast for the North East region predicts temperatures of around 1° or 2° at the start of next week, with snow on the agenda for Tuesday, continuing into Wednesday.